View More In Power Strips. USB HIGH-SPEED CHARGING SURGE PROTECTOR: Max single USB output of our electric USB surge protector power strip is up to 2.1A(Toal USB output: 4.8A) that can gives your devices a fast speed charge! NO SAFETY HAZARD AT ALL: Multiple protections! 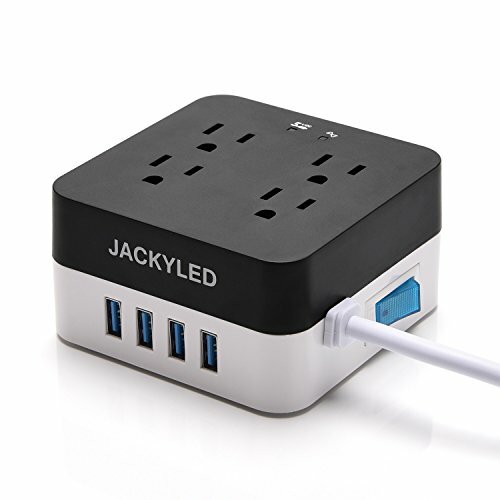 This usb power strip electric outlet has lightning protection, surge protection, overload protection, and fireproof function in the sockets(V0:Very high level). It will automatically cut power to protect connected devices when voltage surge or over-current is detected. Please be assured to use our surge protector power strip with usb. SPACE SAVING:3.6" x 3.6" x 1.9". Very small size. This surge protector power strip keeps your desk clean and tidy. It is great for travel. SATISFACTION GUARANTEE: 100% satisfaction guaranteed. 60 days changing or refunding without reasons. JACKYLED Products are only sold by Jackyled Direct, So if you purchase a product from another seller, please request a refund for it is a counterfeit. Jackyled Direct is the only Authorized Dealer of Jackybrand products.